The Crested Caracara, also known as Northern Crested Caracara or Northern Caracara is a carnivorous raptor whose range of habitat encompasses many parts of United States. They belong to the family of birds known as “Falconidae” but unlike the falcons who are fast moving aerial predators, the Crested Caracara is a slow moving bird and operates as scavengers much like vultures. 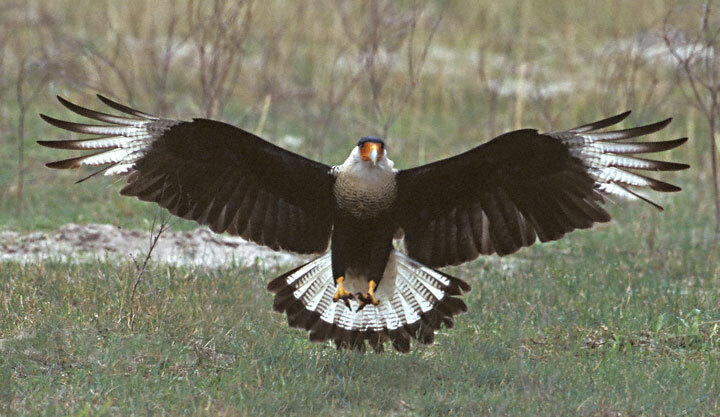 The Crested Caracara was also known as Audubon’s Crested Caracara during older times. 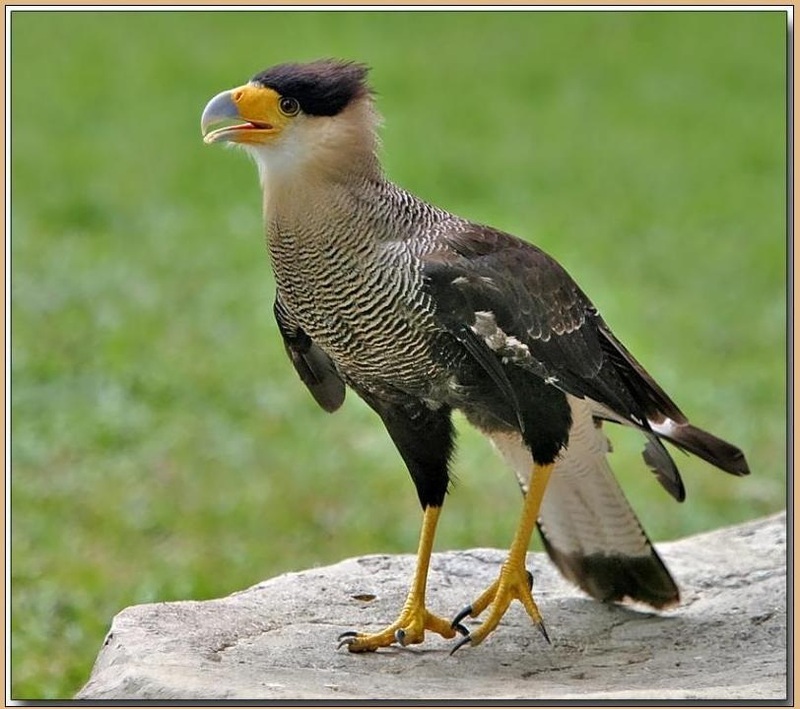 Crested Caracaras are falcons of a medium size having broad wings and a long tail. The length of their body varies between 19 and 23 inches and they have wings which span for around 4 feet. Their weight generally varies between 1 ¾ to 3 ½ pounds, although it can also vary depending on the different types of locations where this bird may be found. The outward appearance of Crested Caracaras of both sexes is very similar. The color of the Crested Caracara bird is primarily black with a black crown in its head. The neck portion of the body and the lower part of the tail is white. White patches and spots can be found around the tips of the wings. The face is crimson in color and the beak of the bird is of a gray tone. Their beaks are sharply hooked. The preferred habitat of the Crested Caracara birds consist of dry and open locations having limited vegetation and only a few trees. For example, they like lowlands and countryside areas such as pastures and ranches, river edges and savannahs. They can also be seen in certain forest areas and marshy lands. Crested Caracaras can normally be found in several parts of United States, such as in the south-western states of Texas and Arizona, in Florida as well as in San Francisco, California. It is also found in Central and South American countries in places like Cuba, Mexico, Peru and northern parts of Amazonian Brazil. The crested caracara birds are very opportunistic when it comes to feeding and it likes certain types of food. They may search for insects under vegetation or may go through leaves to look for insects and bird eggs. Crested caracara birds practice piracy as a common feeding behavior. They can also harass birds like vultures, Cattle Egrets and Red-tailed Hawks and make them disgorge their meals. They not only have their own food but also often steal food from other species. They start their hunting activities very early in the morning as they intend to take advantage of the absence of vultures from the early morning sky. In most cases, crested caracara birds like to tread along open ground in their long and sturdy feet, though they are good flyers. They like to exploit all types of food resources in their territory, leaving no stone unturned to find a good meal. They can dig in grounds to find insects and can catch small birds while flying or running, carrying the prey on its talons. 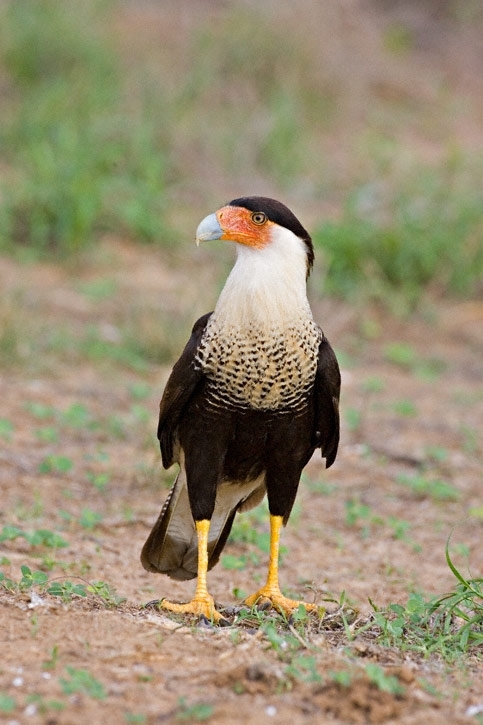 With the help of its sharp beak, crested caracaras can rip off bulks of flesh from carrions. These birds are diurnal in their habits. They build their nests with large sticks in trees like palm trees and mesquites or in the ground. 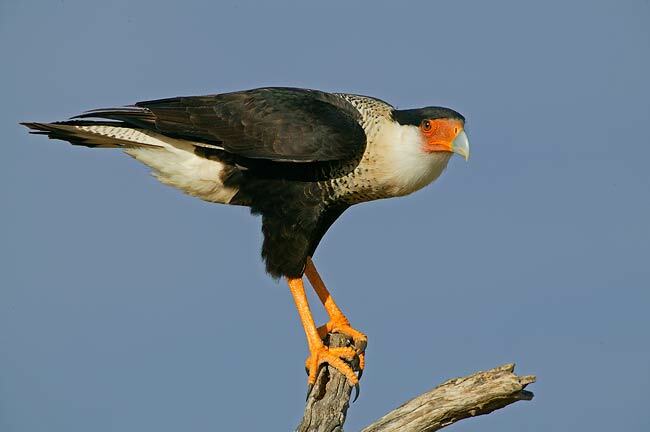 Crested caracaras are territorial birds and return to the same nest site year after year. They mark their territory by calling in a coarse, grating manner all the time while hovering over the nest and sitting there. Crested caracara birds are generally solitary but can also be seen often in pairs or in small groups consisting of three to four birds. While feeding on a carcass, the number of crested caracaras gathering together in one place may reach well over sixty. Normally lifespan of crested caracaras extend to up to nine years. The main food of Crested Caracara consists of animal carcasses and carryon. Apart from these, caracaras also like to feed on worms and insects, turtles, invertebrates, reptiles and amphibians, birds, crabs, fish, eggs, nestling birds, small vertebrate preys and mammals. Crested Caracaras can often be seen flying steadily by making noisy flaps with its wings, though seeing them soar high over the sky is a rare scene altogether. They have strong wing muscles enabling them to be strong albeit a little slow flyer. Normally, they glide low over the ground and their flight pattern often takes twists and turns like Harriers. The voice of crested caracara is like a coarse cackle and their call has a rasping sound, which sometimes extends to create a shriek. Crested caracaras form their nests in isolated palm trees, cactuses or on the ground surrounded by small vegetation and shrubs. The nests may be formed in shallow or marshy areas as well as under desert rocks. Nests are normally build with sticks and then every year the birds add more material to the body of the nest. The nests are also lined with grass, wool, feathers, fine materials as well as things like dried skin and bones. The breeding season is from the months of November to February. The female birds lay around 2 to 3 eggs. The eggs are usually white, buff or pink colored, having brown smudges across them. The incubation period ranges from 28 to 32 days. Incubation responsibilities are shared by both male and female birds. After the eggs are hatched, the young birds stay with their parents for almost like 3 months before starting to become independent. Crested caracaras lay only one or two clutches per season, with the number of eggs being only two to three per clutch. Though young caracara babies spend a long time under parental supervision, their chances of survival are very low. Fire ants are a considerable threat to the survival of young caracaras. Young caracaras that are becoming newly independent often die while they search for dead carcasses. Crested caracaras have been declared as an endangered species almost on the brink of extinction. Factors such as a reduction of habitat grounds triggered by human development and lack of food have been responsible for their present endangered status. At present, the number of crested caracara birds in United States appears to be more or less stable, though historically their numbers have declined in the past. This is especially true in Florida, where this species are still resident but is considered as an endangered species. Protective measures are needed to be taken to ensure the survival of this species. Crested caracaras are believed to be the species historically portrayed as the “Sacred Eagle” in Aztec codices and in Florentine Codex. This has made Crested Caracara the national bird of Mexico.